The Comprehensive Program Development Guide aims to assist the development, implementation, evaluation, enhancement, and sustainability of peer support programs. 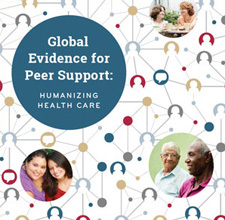 A working document that catalogues current resources for peer support programs, the Guide will be expanded and revised over time with additional information, tools, and materials. We welcome suggestions from all users. The Guide represents a comprehensive approach to program development and management that encompasses key behavioral, organizational, programmatic, and system elements needed for successful peer support programs. Unique in its scope, the Guide also covers complex, emerging areas such as organizational integration, quality improvement strategies, financial management, policy implications for quality assurance, and advocacy for peer support programs. In support of CHW programs on the ground, an expanding body of research confirms that CHWs will be playing even bigger roles in Latino health in the years to come. The evidence gives us strong reasons to champion CHWs as a strategy for alleviating Latino health disparities. Read our August newsletter for program resources and research briefs on CHWs in Latino health. From June 17-18, Peers for Progress and the National Council of La Raza hosted a meeting of Peers for Progress investigators and the National Peer Support Collaborative Learning Network in San Francisco, California. Over two packed days, we reviewed the state of the evidence in peer support for diabetes management and looked ahead to the future. Reminded of our common principles and the importance of this work, we found in San Francisco the vision and the resolve to move forward. In this newsletter, you can read our reflections and find resources developed for the meeting. Visit our archives for past issues of the Peers for Progress newsletter.